This week’s Tuesdays with Dorie assignment was making Peanut Butter Change-Ups from Dorie Greenspan’s new cookbook, Dorie’s Cookies. These are pretty much fully loaded peanut butter cookies because there are tons of peanuts and a jar of peanut butter in one batch! These cookies are soft and crunchy at the same time (the crunchiness comes from bits of peanuts), or perhaps like tiny peanut butter cakes. If you’re a peanut butter lover, you’ll love these cookies! If you have peanuts and peanut butter laying around, then you can and should definitely make these Peanut Butter Change-Ups. Most of the ingredients are pantry staples: flour, baking powder, sugar, salt, butter, and eggs. Nutmeg is included in this recipe, but I really didn’t taste it in the final product. I didn’t expect to use almost an entire jar of peanut butter! This was a good indication that this recipe would live up to its name! On top of the jar of peanut butter, I chopped up one cup of peanuts to drive that peanut-ty flavor home! The first step to making these peanut butter cookies was creaming butter with the peanut butter and some salt. The butter and peanut butter came together pretty quickly because they were both at room temperature. When the butter and peanut butter mixture was smooth, I added granulated sugar and brown sugar and let them mix for another couple of minutes. I added two eggs, one at a time, after the sugars were well-incorporated. The cookie dough looked fluffy; it reminded me of cake batter. The dry ingredients went into the mix after the eggs. I only mixed these for a few seconds before there were no traces of flour left. The last addition to the cookie dough was the chopped peanuts! I left some peanuts roughly chopped because I thought it’d be nice to see chunks of peanuts in the cookie. This dough was pretty soft, so a cookie scoop came in handy when it was time to scoop the cookie dough out. I sprinkled some sugar on top of these peanut butter cookies before they went into the oven. These cookies aren’t that sweet, so the sprinkling of sugar really helped bring out some great flavor. These peanut butter cookies baked really quickly and they firmed up nicely as they cooled. I think my dad would enjoy these cookies. He enjoys all things peanut butter! I enjoyed making these cookies because they were quick to come together and they utilized simple ingredients. This recipe is a keeper! Recipe for Peanut Butter Change-Ups (Peanut Butter Cookies) can be found here. 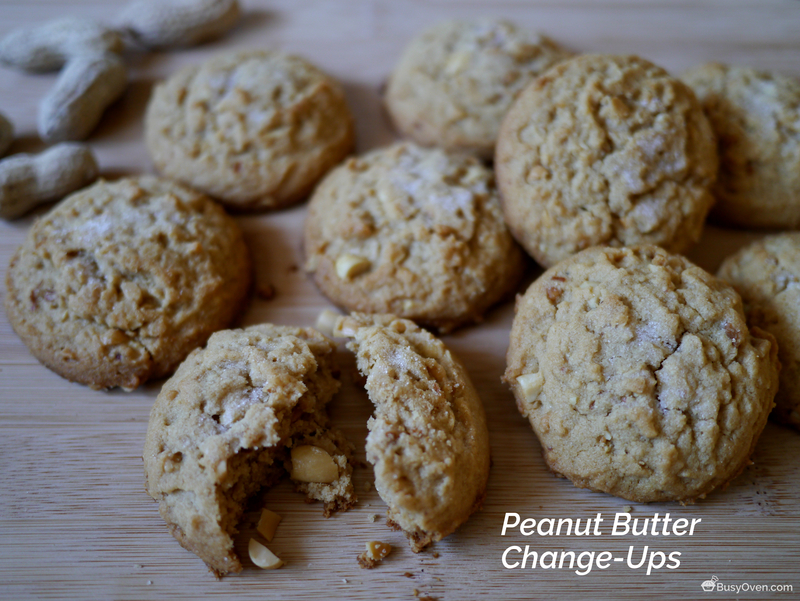 Peanut Butter Change-Ups recipe is on page 152 of Dorie’s Cookies by Dorie Greenspan. I love how much peanut butter is in these cookies! Your Instagram photo of the cookies with the peanuts look fantastic! Your cookies look great. I really enjoyed these. These were great weren’t they? I used different nut butters and it worked a charm! these look great and so peanutty! loved these when i made them. I am really enjoying your process photos…you do such a nice job telling a recipe story. And your cookies look wonderful as well. I loved all of the peanuts in these. I don’t make PB cookies very often, but I do enjoy them. Will definitely make these again. Great job! I am glad that I am not the only one who did not taste the nutmeg. I hope your Dad enjoys these. I did not taste the nutmeg either! What beautiful photos. Love your post.